As part of the Amala Bharatam Campaign (ABC), the Mata Amritanandamayi Math has decided to observe the fourth Sunday of every month as Cleaning Day with a view to making India litter-free. It is hoped that on this day, everyone will set aside at least one hour to cleaning their surroundings. As a start, on November 28th, the fourth Sunday of the month, one lakh families in Kerala will spend an hour cleaning the area around their houses and the nearby public areas. In addition, public places will be cleaned with the help of the general public and the co-operation of the local administration. District-level taluk organizations will lead the cleaning efforts, and arrange for the plastic waste collected during the cleaning to be sent to recycling centres. On the fourth Sundays in the coming months, ABC volunteers will rope in their neighbours to form family-based units for waste disposal activities. As part of ABC, they will be given training in vegetable farming using compost made from waste collected from houses. 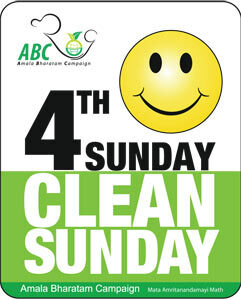 It is hoped that everyone in Kerala will participate in the ‘Fourth Sunday, Clean Sunday’ scheme, regardless of caste, creed or political affiliation. The service and co-operation of the business and industrial communities are especially crucial in this cleanliness drive. It is hoped that proprietors and employees of their companies will spend at least a few hours on the fourth Sunday of every month in clearing the waste from the area around their companies’ premises.